Layups 4 Life is a 501(c)(3) non profit organization founded by husband and wife Dan and Dana Exter. Entering their fifth year of operation, L4L has raised thousands of dollars benefitting cancer research and clinical trials, supporting one of the nation's leaders, Memorial Sloan Kettering Cancer Center. After his own battle against cancer at the age of 27, Dan wanted to take a stronger stance in the fight against this disease. 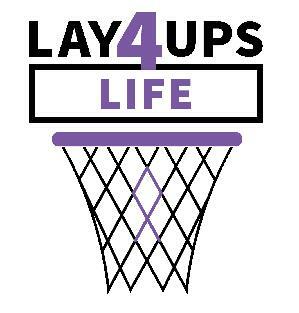 With the determination and passion in wanting to make a difference in the fight against cancer, Layups 4 Life was founded in 2014. Through events in the fitness and social space, Layups 4 Life encourages and promotes good health, physical activity and people coming together, supporting this great cause. L4L strives to do their part in aiding the doctors, nurses and researchers on the front line, leading the charge for a cancer free future. Over time, L4L has made multiple contributions to leukemia, pediatric and bone marrow research departments, has supported clincial trials and doctor's in need of further funding to advance their work. As Layups 4 Life embarks on their fifth year, they are excited to see what they can achieve. With a goal of $100,000 in five years, they are only $25K away from their goal! We did not get to this point without the incredible support of our donors, sponsors, friends and family. In this new fundraising season we ask for your continued contributions. Share this link with your friends, colleagues and family members. Post it on your Facebook page or any other social media. You can also become a L4L Leader and create your own fundraising team by starting a personal fundraising page. We will be able to achieve this goal if we all come together and work as a team! If you have any questions or want to email us about how to get more involed, you can do so at layups4life@gmail.com. You can also connect with us across all social media using @layups4life. To learn more about our organization, visit our website at www.layups4life.org. We thank you for your continued support. Together, we can beat cancer, one layup at a time. Rob Kleeger - Digital4NX Group, Ltd.